Go lightweight and classy but keep the tough durability with a synthetic leather look holder from Blackhawk. The Molded Single Handcuff Duty Pouch is constructed with five layers of nylon laminate material molded over an integral core of polymer that will withstand the rough and tumble of daily use on the beat. This handcuff pouch features a protective coating finish that counteracts blood-borne pathogens for your safety. 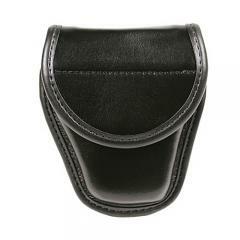 Blackhawk's solid and sturdy cuff holder closes with a flap top that keeps cuffs securely in place. The pouch holds a single pair of standard sized handcuffs.